Performers include: Brian Cox, Jeremy Strong, Hiam Abbass, Sarah Snook, Kieran Culkin, Alan Ruck, Nicholas Braun, Matthew Macfadyen, Natalie Gold, Peter Friedman, and Rob Yang. 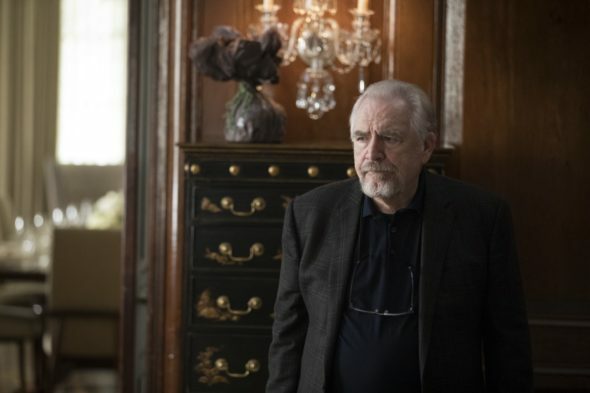 From creator Jesse Armstrong, the Succession TV show centers on the Roy family. They control the powerful, international media conglomerate, Waystar Royco. Although patriarch Logan Roy (Cox) has always been a force with which to be reckoned, it is time for him to pass the torch, which he is not quite ready to do. The drama unfolds in New York, where Logan lives with his third wife, Marcia (Abbass). While she is a loving spouse, Marcia is a tough cookie in her own right. The family also includes Logan’s four children, sons Connor (Ruck), Kendall (Strong), Roman (Culkin), and daughter “Shiv” i.e. Siobhan (Snook) . Although he is Logan’s eldest son from his first marriage, Connor has been off in New Mexico, living his own life. Similarly, Roman, the younger and more outgoing son from Logan’s second marriage, no longer works at the family business. Meanwhile, youngest child Shiv is trying to forge a political career. As the first son from the second marriage, and the only one of the four kids involved at Waystar, division president Kendall is Logan’s heir apparent. When younger cousin Greg (Braun) moves from Canada to New York, looking for the opportunity to manage the company’s theme parks, all four of the Roy siblings reunite with him and each other. Shiv’s ambitious boyfriend, Tom (Macfadyen) is a Waystar Royco senior executive. There’s also Rava (Gold), Kendall’s estranged wife and mother of his two children. Rounding out the circle is longtime family friend Frank (Friedman), Waystar COO and Kendall’s mentor. Kendall is in the process of buying out a digital media company from its CEO and founder, Lawrence (Yang), when Logan announces that despite celebrating his 80th birthday, he has decided to remain as the Waystar Royco CEO, indefinitely. Kendall is crushed. His siblings are none too happy either, when they learn their father has new plans for how to go about selecting his own successor. Succession explores the sometimes fragile bonds between family members and delves into the ways in which wealth and power can distort and destroy them. What do you think? Do you like the Succession TV series? Should this HBO TV show be cancelled or renewed for another season? Please bring it back. What a great show. Needs to be promoted more! I love this show. Takes me out of my element. It’s a great show please bring it back, don’t cancel! I’ve been waiting and waiting for the return of this excellent show, with excellent writing, and excellent actors. PLEASE BRING IT BACK. I was counting on it to get me through the winter! Please do not cancel succession bring it back for another season. I just love this show and I already miss it.